If you’re experiencing problems with your dryer such as taking twice as a long to get through a single load of laundry, if you have never had your dryer vent cleaned or noticing that the exterior of your dryer becomes extremely hot to the touch, it may be signs that you need to call a professional dryer vent cleaner to get your vents checked. But is it really necessary to spend money to have your dryer vents cleaned instead of just working through and tolerating your dryer’s subpar performance? Our sister company Dryer Vent Cleaner carries out all our dryer vent cleaning services for all our valued customers. True professionals not using compressed air like the duct cleaning companies use they use use professional dryer vent cleaning equipment that guarantees your dryer vent is as clean as it was when it was first installed. Is Dryer Vent Cleaning Really Necessary? A half-inch lint build up in a four foot dryer vent could slow down your dryer by up to 50% making you need to do extra cycles to get through a single load of laundry. This not only does this eat up precious time off your busy day, it also inflates your monthly electric bill needlessly. Your dryer is the second most energy-guzzling appliance to your home next to the air conditioner and dirty dryer vents only make it more inefficient in its electricity consumption. Dryer vent cleaning will pay for itself in terms of energy savings and peace of mind. It is a fact that lint clogged dryer vents cost an extra $18 to $25 per month that’s $300 per year extra you could be paying due to lint build up in your vents. Frequent usage of your dryer will have its normal wear and tear effects on its parts. However, if its vents have lint build up, it is forced to work extra hard to be able to get the job done and this will only hasten its deterioration. It can also cause malfunctioning of essential parts such as the heating elements and the heat sensor safety switches.Regular maintenance and dryer vent cleaning will save you from hassles and extra costs of repairs or part replacements which can get expensive. Lint is very flammable. A single spark can start a localized flame that can easily spread when it comes into contact with other highly flammable items like clothes and fabrics. Your dryer produces and uses hot air in order to dry your clothes and having lint build up on your dryer vents will make your dryer retain more heat because its exhaust is clogged so there’s no way for the heat to escape. Try touching your dryer while it’s being used. You’ll notice that it’s extremely hot to the touch on the outside, imagine what it’s like on the inside and imagine that heat having a direct access to an area where lint build up is present. It is a fire accident waiting to happen. Dryer vent cleaning does not take too much time to complete. Professional dryer vent cleaning services can finish the task in a matter of hours. You also won’t need to have your vents cleaned more than twice a year so if you’re thinking that having your dryer vents cleaned is too much trouble, you’ll be glad to know that it really isn’t. Protecting your home is definitely worth a few hours in a year. Cleaner windows offers professional dryer vent cleaning in the Halton area of Ontario, for commercial and residential customers. We use hi-tech equipment to assess the condition of your dryer vent set up and how efficient it is running. 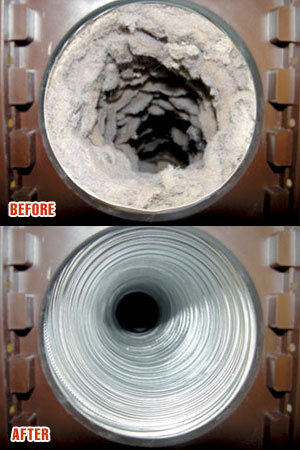 We then proceed to clean out your dryer vents, and lint build up in your dryer. To schedule a dryer vent cleaning appointment please contact us on 905 966 0838 or use our online form. Our pricing for dryer vent cleaning starts at $99 for basement and main floor located dryers, slightly more for second floor. Dryer Cleaning we also offer dryer cabinet cleaning where we strip the dryer down, opening up the cabinet removing the drum and blower housing. This removes all the lint that has built up behind the dryer drum, inside the blower and from on the motor, switches and other areas. This is something the dryer manufacturers recommend be carried out every 2-3 years. We recommend that if using the white plastic or foil transition hoses that you change them, both are extremely dangerous and are not recommended by dryer manufacturers. An all metal transition tube with 90 degree elbows to ensure the hose does not get crushed. We can change your transition tube for a recommended one when we clean your dryer vent.